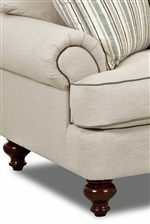 The Ashworth collection offers the ultimate in luxury and shabby chic style for your living room. This upholstery collection is made in America, and features durable construction techniques that will hold up to everyday use. Plush down blend cushions are s0 comfortable, you can really sink in and relax. Bring this stylish collection into your home for a quick upgrade.